Aberdeen, Hibernian and Inverness CT are also represented in the SPL XI. Celtic and Motherwell both have four players each in the PFA Scotland SPL Team of the Year. Darren Randolph, Shaun Hutchinson, Nicky Law and Michael Higdon are named from Stuart McCall's men, who are on course to finish second in this year's top flight. 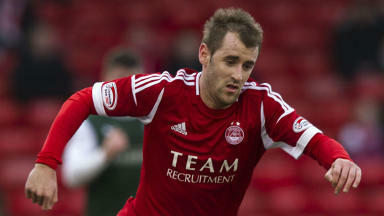 Inverness CT's Andrew Shinnie, Aberdeen's Niall McGinn and Hibernian's Leigh Griffiths are also included. In the First Division team of the year, winners Partick Thistle have five players while runners-up Greenock Morton have just one inclusion in Michael Tidser. First Division Team of the Year: Scott Fox (Partick Thistle), Stephen O’Donnell (Partick Thistle), Jordan McMillan (Dunfermline Athletic), Callum Morris (Dunfermline Athletic), Aaron Sinclair (Partick Thistle), Stefan Scougall (Livingston), Stuart Bannigan (Partick Thistle), Michael Tidser (Greenock Morton), Brian Graham (Raith Rovers), Lyle Taylor (Falkirk), Chris Erskine (Partick Thistle). Second Division Team of the Year: Lee Robinson (Queen of the South), Chris Mitchell (Queen of the South), Mark Durnan (Queen of the South), Ben Gordon (Alloa Athletic), Chris Higgins (Queen of the South), Alan Trouten (Brechin City), Daniel Carmichael (Queen of the South), Ryan McCord (Alloa Athletic), Steven Doris (Arbroath), Nicky Clark (Queen of the South), Andy Jackson (Brechin City). Third Division Team of the Year: Jamie Barclay (Clyde), Stephen McNally (Montrose), Ricky Little (Queens Park), Lee McCulloch (Rangers) Lee Wallace (Rangers), Lee Currie (Berwick Rangers), David Anderson (Queens Park), Daniel Moore (Elgin City), Andrew Little (Rangers), Rory McAllister (Peterhead), David Templeton (Rangers).